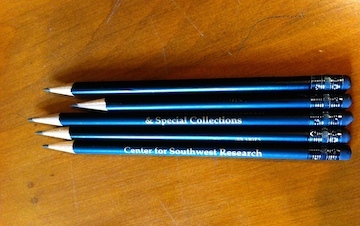 Pencils, Center for Southwest Research, University of New Mexico, Albuquerque. “Every archive is different, has its own set of rules. But by the time you sit down at a table in any special collections reading room you have likely filled out your paperwork and presented your ID. You have explained the topic of your research to an archivist, and described what documents you are interested in examining. You have stashed most of your belongings in a locker and carried only a laptop (absolutely no pens allowed!) into the room. Once you sit down, you search for an outlet that works. You sift through a container of tiny pencils to find the one that is sharpest. This can take a while. You fill out the call slip (paper or electronic) and hand it to the archivist. Then you wait. To read the rest of this column, click here.